Wah the Phillip Phillips Album I just bought on Thurs is SOOO good! This is restoring the faith I have in albums that all songs are good! What got me collecting albums were a few things. First of all, I never really downloaded music when I was young. My sister did and she had like over a thousand songs! But I never really got how you can have thousands of songs to only listen to a few. So when pastor said that he got rid of all his downloaded music in his computer, it encouraged me to not download even more. Second, I have a good experience with albums. The first album I ever purchased was the Michael Bublé’s Christmas album! I remember how when I was playing it on my mum’s laptop on repeat. It was so good! Then I actually viewed albums as good gifts. I realised that people that download music would not mind albums as well! It made albums a very good gift! It’s $20+ legit price for a present and everyone likes it! 🙂 so I bought Esther the Switchfoot album and Charis the MB Christmas album. Seeing how much they liked it encouraged me to buy albums. Then I got a Lifehouse album, No Name Face, I recall how much I loved the arrangements and the catchy music that Jason Wade sang! So over the years, after I got my ATM card and my allowance in my account every week, it became easier to save and spend on what I want. At first, I would buy both drum sticks and albums so I had to moderate my spending. However when Leb they all pool money to buy me a brick of sticks Christmas 2 years ago, that freed me to buy more albums! In fact, that(a brick of sticks) was a very good present! I am still using the brick! I think a brick could last me a good two years! Haha I sure wouldn’t mind another brick this year! Combine birthday and Christmas present I also would not mind! It feels good to be sponsored with drumsticks! Okay back to the topic of albums! So yeah with the good impression of albums, I dived myself into the world of CDs and got myself a ton of CDs! Haha ask me about it in person! I will show you my very cool photo of my album collection! I would say that I bought all of them, but there are some CDs that I buy just to try something different or give that particular band a chance! It’s like I never even heard of them until I got to HMV and I just have faith and buy! So far very few passed the test, the 5SOS album was alright. The Fray passed, I quite like their album! Jason Mraz’s “Yes” passed with flying colours! Mcfly’s “Memory Lane” passed very well as well. However, I once bought a female chinese album just to try more Mandapop, but was disappointed. 五月天 is still the king! So I would be crazy to post this without recommending some albums of mine! This is a must have album for any rock/punk/emo/acoustic lover! Chris(the singer) writes amazing songs and his voice is to die for! It is extremely well arranged and written! All of their songs there are good! Even though it’s $28.90, I felt that it is worth every penny of the $28.90 I paid for! Ok 五月天 is the band when it comes to Mandapop! I can personally vouch for their quality in any album! I have yet to find an album that I was disappointed with! Their lyrics are skillful. Their music arrangements are so clever. Their band is so tight! They play from dance music to ballads and they are GOOD. I chose 步步 just because it has most of their nice songs and for a good price too! It’s like 30 songs for like 21+ it’s a good price! This is the album when John Mayer is at his peak! Honestly, I prefer some of the studio versions compared to some of the songs here, but John Mayer is as good here. This was the album that featured him performing only with an acoustic guitar and a mic! Neon is by far one of the most sick performances I have ever saw on YouTube. In your atmosphere is very nice as well! It’s funny how he sang about not going LA in LA. The other must have album of his, is “Room for Squares”. This album has the best mixing I have ever heard! There is so much going on, yet you can hear every single minor detail. Every fill in. Every instrument with clarity and yet not messy and chaotic at all. It was very fun to listen “Your Body is a Wonderland” and hear all the little “I’m never speaking up again, I’ll use my hands” and little drum fills here and there. Very nice! This is the album that has “Awakening”! This album is good! I remembered this was my go-to album whenever I have no idea what to listen to. I think this album shows Switchfoot in the best way possible! Not to say that the other albums are bad, but the one that really shows Switchfoot as what is it is, is this album! This was my first Lifehouse album and personally my favourite, but I haven’t heard “Lifehouse”, supposed to be their best album from Elliot and Josh Lui’s opinion. However, no one can refute that No Name Face was good! It really is! Very nice! They are simple yet nice! 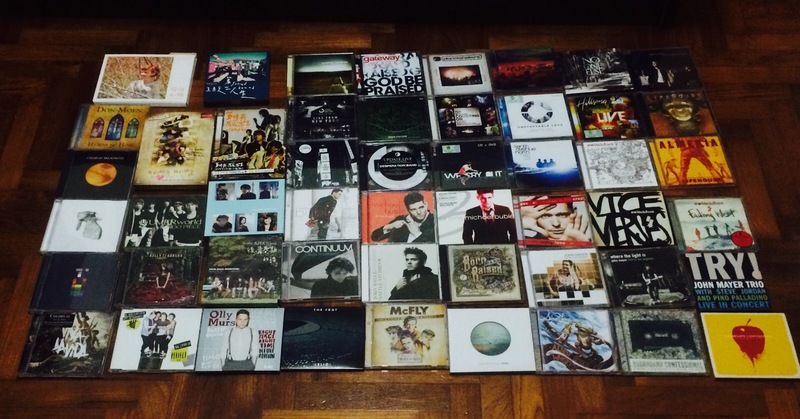 I don’t have a lot of mcfly’s albums, but they are good! Like if I put my IPod on shuffle and they turn up, I will enjoy myself! If I jammed to their songs on drums, I will find very fun stuff to play! It is such a beautiful album. It has songs that never intrigued me so much since I discovered Dashboard and 五月天! Was so glad I bought it and gave him a chance! I guess the American Idol winner will not be all that bad! He is simply stunning. The album tracks all have the same theme and is very cohesive! The lyrics and writing is just so good! Wished I could have bought his other album too! He seems like someone I can follow very closely to! This was the album I bought the day I went to watch them live! Wah, Jesus Culture is very nice! They were like my Dashboard and 五月天 of Christian music! They are very good in dynamics and spirit led kind of moments! Something I really have to learn! When you put Kim Walker, Chris Quilala and Martin Smith together you know you will stumble upon gold! Very good!